Chief Constable Anthony Thomas Lefroy. Born 1802 in Northumbria, son of Captain Anthony Lefroy of the 6th Regiment and Amelia Elliott. Captain Anthony Lefroy was stationed as Barrack master in York for many years, whilst Amelia Jane was daughter of George Letsome Elliott who was part of the Bombay Civil Service . With a strong military heritage, Anthony Thomas Lefroy pursued a career within the police. Aged 21 he joined the Irish Police force. In 1822 Ireland was at the forefront for the revision of policing structures, focusing on a single police force that worked through a system of organised county constabularies, under the title of the New Constabulary Force. It was not until 1939 that this model was adopted within England, Gloucestershire was the second rural police force to be formed in Britain. As Gloucestershire’s police force was emerging, it seemed wise to look towards the Irish force for guidance who to appoint as Chief Constable. It was the head of Ireland’s Inspectorate, Colonel MacGregor himself who put forward Lefroy’s name as a worthy candidate. On the 18th November 1839 it became official, Anthony Lefroy was appointed as Chief Constable of Gloucestershire. It did not take Lefroy long to settle in, merely two weeks after his appointment he had already hired six new superintendents and thirteen constables all from the Irish Police. All worthy candidates because of the strict code imposed upon them through the Irish Police which affected both private and working life. Lefroy used the structure he knew from the Irish forces and now had an Irish task force at hand to enrich training and structure for the Gloucestershire Constabulary. The ’New Police’ came under much criticism as there was a worry and opinion that the force was unnecessary. These opinions were reinforced because of the over-zealousness or drunkenness from certain officers, Lefroy came down with a stern hand and between 1st December to the 30th June 1840 he had dismissed 14 constables for drunkenness. The strict nature of the force that Lefroy imposed restored faith for the county so that by 1850 most people had begun to accept the importance of the constabulary. The size of the force grew considerably under Lefroy. During the initial years of the New Constabulary; Cheltenham, Tewkesbury and Gloucester remained independent through the Municipal Act Corporations Act of 1835. Cheltenham officers were located in a separate office which was situated opposite the headquarters of the New Constabulary and consisted of 45 officers. It was not until 1854 that Tewkesbury came under Lefroy’s command, and then the City of Gloucester followed suit in 1859. Other issues that arose for Lefroy because of the infancy of the force was the lack of consistency at a national level thus allowing criminals and fugitives to escape into neighbouring counties. This problem was resolved in 1856 when the County and Borough Act was passed which forced local authorities to form paid Police Forces. Now there could be liaisons and correspondence with neighbouring counties and the foundations of an entirely consistent force across the country began to emerge. Anthony Lefroy was committed to his officers and though he could be tough when enforcing rules, he was also compassionate and cared for the welfare of the serving members of the force. In 1856 he decreed that ‘each man will have one night’s rest in the week’. In 1861 the first recorded police murder occurred with the death of Samuel Beard. Anthony Lefroy remained in control of the Gloucestershire Constabulary until 1865 when he retired on the 1st July at the age of 62. Lefroy had led the Gloucestershire Constabulary for 25 years bringing the force through infancy and into a respected and effective force with a total of 288 serving members. 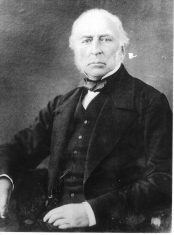 Lefroy retired with a healthy pension scheme of £333 per year for nearly 25 years, until he died at the age of 88 on the 23rd March 1890. 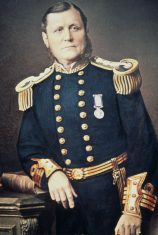 Chief Constable Admiral Henry Christian, Member Victorian Order, Kings Police Medal. Chief Constable 1865 – 1910. The 1st July 1865 saw Admiral Henry Christian become Chief Constable at the age of 34. Admiral Christian had already led a successful career within the Royal Navy before joining the Constabulary. He came from a family of sailors; his father was a merchant in Malta who took Christian out to sea for the first time in 1840 when he was 12 years of age. Also related to Admiral Christian is the infamous Fletcher Christian of ‘Mutiny on the Bounty’ who was a distant cousin. The Navy provided an ideal career choice for Christian as it allowed for life at sea, a pleasure which was truly close to his heart. Working vigorously within the Navy led to promotion, by 1860 he became second in command of the Royal Yacht Victoria and Albert. By 1863 he was promoted further and became captain, where he had the honour of transporting Princess Alexandra alongside many members of foreign aristocracy to the wedding of Prince Edward. Soon after the wedding Admiral Christian retired from the Navy and married Emily Margaret. Not long after retiring from the Navy was when Christian came to Cheltenham, in the year 1865 where he moved into No1. Crescent Terrace and took over the role of Chief Constable for the Gloucestershire Constabulary. Through analysing records of the time Christian was in command of the Constabulary a correlation can be seen between the number of offences and arrests, providing evidence of a successfully run force. Strong leadership for the Constabulary. Admiral Christian was another strong leader for the constabulary who imposed strict ruling both inside and outside working hours. Constables were not allowed to visit public houses either on or off duty. If a constable was caught in a public house, or even accepting food or drink from anyone, dismissal could occur. Smoking was also of concern for Christian, so much so that several men were cautioned for smoking off duty. A Check-System became implemented ensuring that each beat was patrolled properly. Constables were issued with tickets and a number of addresses, usually of local ‘notables’ where he was to leave them. They were collected later by supervisors. This system remained in place up until the Second World War. Identity was another key issue for Admiral Christian, to tackle this he brought in the use of warrant cards in 1881. 1895 brought a second police murder, Sergeant William Morris who died on the 10th November. Other key aspects of Admiral Christian’s ruling are expansion. Christian increased the transportation of the force and brought 12 bicycles at £12.13.0d each. With the use of bicycles officers would be able to patrol larger areas and cover grounds at a quicker rate. Also under Christian communication increased as phone lines were installed between Cheltenham and Gloucester in 1897. Coleford, Lydney and Cinderford the following year. There was a decrease of the Gloucestershire boundary, in 1897 as Bristol City took over 11 stations under the Bristol Corporation Act where the City and Council of Bristol was expanding. 1910 brought the retirement of Admiral Christian at the age of 81. His final salary before retiring was £570 per annum and he obtained a police pension of £380 per annum, which he enjoyed for the final years of his life until he died in 1916 aged 87, he was a Member of the Royal Victorian Order and the holder of a Kings Police Medal. Chief Constable Lieutenant Colonel Richard Chester-Master. 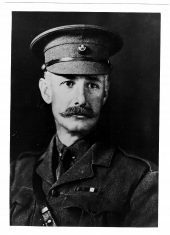 Distinguished Service Order Chief Constable 1910 -1917 Recalled to the colours 5th January 1915 killed in action 30th August 1917. Lieutenant Colonel Richard Chester Chester-Master was the first appointed Chief Constable with local heritage as he was raised in Cirencester. His leadership of the Constabulary was brief, totalling a span of 7 years, but this was not to say his time was not eventful. Chester-Masters implemented many changes during his time, one of the first being the changing of the Chief Constable’s Circular Orders to General Orders. General Orders allowed for a collection of news, legislation and new practices to be relayed throughout the force. Another change occurred in October 1910, which saw the beginnings of a mounted police force. Chester-Master purchased saddles and riding equipment for the constabulary and implemented a scheme where horses could be hired and ridden by experienced officers whenever necessary. This system stayed in place until shortly after World War II. The working hours were long for the constabulary; it was not until 1910 that the weekly rest day was implemented. Chester-Master concluded that all constables and police staff were required to take 52 rest days a year. It was stated that these rest days had to be taken every seven days and could not be accumulated, therefore ensuring that a day was taken for rest weekly. On the 27th June 1911 the Secretary of State agreed to increase the force by 12 extra constables ensuring that the rest day act could effectively occur. Training was also on the agenda for Chester-Masters and he included martial arts to the training program, this increased the ability of the force and provided a basic level of protection for the beat officers. During Chester-Master’s time as Chief Constable there were large events occurring effecting Britain as a whole, the largest being the Great War. Before the war though in 1911 large miner strikes were taking place in Wales. The Welsh force did not have the man power to control and police the strikes and called upon the British Constabularies for aid. Chester-Master showed his support by sending two sergeants and twenty-three constables to aid and stay with the Welsh force for two months. 1912 was an eventful year for the Gloucestershire constabulary. The force had increased by enrolling 218 reserve constables and the first motor vehicle was being used as the Superintendent at Northleach had acquired one. The condition of service also changed as Chester-Masters was not satisfied with the current conditions and implemented a change that officers had to abide by; these conditions covered a broad spectrum from pay, uniform and behaviour. Also in 1912 twenty officers were presented with coronation medals. Reports show that crime levels in the Gloucestershire region had decreased by 1913 and were at their lowest they had been in the last five years. Whether this was due to larger social-economic reasons that was effecting Britain at the time, or a reflection of the constabulary is hard to deduce. Yet it is clear that factually crime rates had decreased under Chester-Master’s time in office. 1914 brought the Great the War and recruitment for the army was required. From the Gloucestershire Constabulary there were 22 army reserves and 21 constables who enrolled. January 1915 Chester-Masters himself was called to action. Military service was not new for him as prior to being appointed as Chief Constable he was a major within the military. With the constabulary aiding the war front, more officers were required to police the Gloucestershire area, a vast amount of volunteers applied. During the war effort between 400-500 persons were registered as special constables. 30th August 1917 Lieutenant Colonel Chester Chester-Masters was killed in action. He was mentioned in dispatches for distinguished and gallant conduct on the field of battle. He also was awarded the Distinguished Service Order. Gloucestershire Constabulary Milestones during the first years. 1842 Home Office Rules that no firearm to be carried by any officer.